If unsteady hands or poor eyesight make it difficult for you to apply eyeliner, lipstick or other cosmetics, you might wonder about permanent makeup. Here’s what you need to know about the benefits and risks. If unsteady hands or poor eyesight make it difficult for you to apply eyeliner, lipstick or other cosmetics, you might wonder about permanent makeup. For many, it’s the word “permanent” that gives pause. This can be the best — or potentially the worst — aspect of the procedure. But is it really permanent? How does it work? Is it safe? We asked cosmetic dermatologist Shilpi Khetarpal, MD, to offer her insight. Permanent makeup, also called micropigmentation, involves the use of a pen containing iron oxide to tattoo the skin and to create the look of makeup. A tattoo can mimic eyeliner or lipstick or it can darken and create the look of thicker eyebrows. It also can camouflage scars and help with the look of an uneven hairline. Who might consider permanent makeup? “Certainly people with physical limitations may seek out this procedure, but anyone — male or female — can have it done,” Dr. Khetarpal says. In particular, people with cataracts, arthritis, multiple sclerosis, Parkinson’s disease or those who have suffered from a stroke may find this procedure appealing. It can help them look their best while avoiding the physical challenges of applying makeup. It also offers an option to those who have allergies to traditional make-up. Are the tattoos really permanent? The most important thing people should know is that permanent makeup is not easily removed, and there are risks, Dr. Khetarpal says. “Removing tattoo pigment can be very difficult depending on the color. It is a long, painful, expensive process to remove the ink, and many times, all of the ink cannot be removed,” she says. Also, while this makeup never washes off, it will fade over time because skin cells are constantly being replaced. How do I find a good practitioner? While most of the people doing the procedure are aestheticians or tattoo artists, you can also search online for physicians performing micropigmentation in your area. How long have you done cosmetic tattooing? “Make sure they use medical-grade sterilization and high quality ink. Also, look for someone who gives natural results, and ask about their follow-up care policy,” Dr. Khetarpal says. Be sure to have a consultation before scheduling any procedure. Consider: Are they professional? Is the office clean? After visiting, talking and observing, do you feel confident going forward? You can request a tour of the facilities, including the room where the procedure will take place, and they should discuss whether you will need anesthesia (usually local). There is always a risk of infection when needles are involved. This is especially true if non-sterile needles are used. People also can be allergic to a particular color or type of tattoo ink. “Once you have a reaction, it can be very difficult to treat. This can be avoided by doing a test area behind the ear to see if there is a reaction,” Dr. Khetarpal says. Other possible complications include bleeding, crusting, swelling, loss of eyelashes, severe eyelid injury, and ectropion, which occurs when the eyelid is turned away from the eyeball. According to the U.S. Food and Drug Administration, pigments also can interfere with cranial MRI scans by affecting the quality of the images. Rarely, MRI scans can cause swelling or burning in the area of a tattoo. The amount varies by the practitioner and the complexity of the work you are requesting, and because it is cosmetic, it would not be covered by insurance. Focus first on finding reputable places before you factor in cost – or perhaps delay or forgo if you don’t find a good fit. What should young people consider? 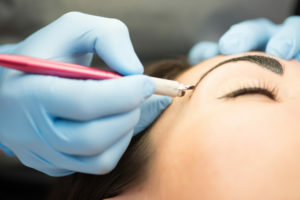 While the promise of permanent makeup can be appealing, think carefully about this decision, especially if you’re a younger person because areas on the face, such as the eyes, eyebrows, and lips, change over time with age. It is also difficult to mimic the appearance of eyebrow hair with tattoo ink, she adds. What follow-up care is involved? You could need multiple treatments, so make sure you talk about this with your practitioner. You also may need to touch up the tattoo as pigment fades with time.